KB Hypereutectic Signature Series pistons are a great way to build a true high performance engine without going to the additional cost of premium forged pistons. 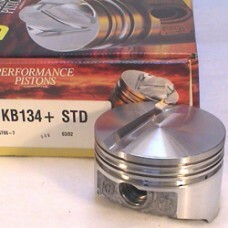 These pistons outperform stock and other traditional cast pistons and consist of many race-winning features. T6 heat-treated alloy containing 16-18% silicone for greater strength, scuff and seizure resistance. These hypereutectic pistons will improve groove wear and resist cracking in the crown area where operating temperatures are severe. Pistons feature 100% CNC machined diamond turned crowns that can increase power and reflect heat into the combustion chamber. Lightweight, yet rigid skirt design helps to stabilise piston, supplied with spiral wound pin retainers for use either as floating or press-fit. The reduced expansion rate of these pistons, allow the use of far tighter piston to wall clearance than that of forged pistons. Tighter piston to wall clearance results in no ‘piston-slap’ from cold start up, improved oil control, reduced blow-by and increased ring life. Pistons are sold in weight-matched sets. Designed for Small Block Chevrolet Stroker engine (3.75” stroke i.e. 383 cu.in.). Flat top with 7cc trough. Rod length 5.7”. Pin Dia. .9272”. Ring Size 5/64”, 5/64”, 3/16”. Size 4.00” (Standard bore).